Degradation of carbohydrate, protein and lipid food reserves occurs in the seed germination process to produce energy for germination and further growing. This study aimed to determine dynamics the content of protein, carbohydrates, and lipid in cotyledon of seed clon i.e. Sca 6, RCC 70, RCC 71 and KKM 22 during germination. The experiment used completely randomized design consisted of four replications with 4 treatments. In each cocoa germination phases i.e. before germination, phase II (bend/curved phase), cotyledon emergence, leaves emergence and fall of cotyledon from the sprouts. This observation were water content, ash content, lipid, soluble protein, total protein and carbohydrate content. The results of the experiment showed that during germination, there was an increase of water content in cotyledon from the bend phase to the leaf emergence and decrease in the phase of fall of cotyledon The highest water content was observed in the leaf emergence phase as high as 69.42%. The content of ash content, dissolved protein, total protein and carbohydrates in cotyledon fluctuated during the bend phase until the leaf emergence and increased in the phase of fal of cotyledon. ipid content has decreased from the bend phase until the fall of cotyledons. Carbohydrate levels have increased from the bend phase to the fall of cotyledons. The speed of degradation procces of seed stored material (water, lipid, protein and carbohydrate content) during germination is affected by differences in seed clones. The Scavina 6 and KKM 22 clones entered the bend phase and the realease of cotyledon. Alencar, N. L. M., R. Innecco, E. Gomes-Filho, M. I. Gallão , J. C. Alvarez-Pizarro, J. T. Prisco and A. B. De Oliveira. 2012. Seed Reserve Composition and Mobilization During Germination and Early Seedling Establishment of Cereus jamacaru D.C. ssp. jamacaru (Cactaceae). An Acad Bras Cienc, 84(3): 823-832. Alvarado, V. and K.J. Bradford. 2002. A Hydrothermal Time Model Explains The Cardinal Temperatures for Seed Germination. Plant, Cell and Environment, 25 (9): 1061-1071. Alvim, P. T. 1997. Cocoa. In Alvim, P. T. and T. T. Kozlowski (Eds.) Ecophyciology of Tropical Crops.Academic Press. New York. p. 279-313. Ananieva, K., E.D. Ananiev, S. Doncheva , K. Georgieva, N. Tzvetkova , M. Kamı´nek , V. Motyka, P. Dobrev , S. Gajdosˇova and J. Malbeck. 2008. Senescence Progression in A Single Darkened Cotyledon Depends on The Light Status of The Other Cotyledon in Cucurbita pepo (zucchini) Seedlings: Potential Involvement of Cytokinins and Cytokinin Oxidase/Dehydrogenase Activity. Physiologia Plantaru, 134: 609-623. Anggrahini, S. 2007. Effect of Germinating Time on The α-tocopherol and Proximate Content of Mung Bean Sprout (Phaseolus radiatus L.). Agritech, 27 (4) :152-157. Anonymous. 2015. Statistik Perkebunan Kakao 2014-2016. Jakarta: Direktorat Jendral Perkebunan. Anonymous. 2016. Quarterly Bulletin of Cocoa Statistics. Cocoa year 2015/16. Vol. XLII, No. 1. International Cocoa Organization. AOAC. 1970. Methods of Analysis. Whasingthon D.C: Association of Official Agriculturan Chemists. AOAC. 1990. Official Methods of Analysis. Washington D.C: Association of Official Analytical Chemist. AOAC. 1995. Official methods of analysis (16th ed.). Washington D.C: AOAC International. Ataíde, G.d.M., E. E. D. L. e Borges, J. F. d. C. Gonçalves, V. M. Guimarães, A. V. Flores and E. M. Bicalho. 2013. Alterations in Seed Reserves of Dalbergia nigra ((Vell.) Fr All. ex Benth.) During Hydration. Journal of Seed Science, 35(1): 56-63. Biehl, B., C. Wewetzer and D. Passern.1982. Vacuolar (Storage) Proteins of Cocoa Seeds and Their Degradation During Germination and Fermentation. Journal of the Science of Food and Agriculture, 33: 1291-1304. Copeland, L. O. and M. B. McDonald. 1985. Seed Science and Technology Secound edition. Minneapolis: Burgess Publishing Company. 321 p.
Davies, H.V and P. T. Slack. 1981. The Control of Food Mobilization in Seeds of Dicotyledonous Plants. New Phytologist, 88: 41-51. Debeaujon, I. L. Lepiniec, L. Pourcel and J-M. Routaboul. 2007. Seed coat development and dormancy, p 25-49. In: Bradford, K.J. dan Nonogasaki, H. (ed). Seed Development, Dormancy and Germination. Blackwell Publishing. Oxford. Doman, D. C., J. C. Walker, N.R.Trelease, and B. d. Moore. 1982. Metabolism of Carbohydrate and Lipid Reserves in Germinated Cotton Seeds. Planta, 155:502-510. Du, J., M. Li , D. Kong, L. Wang , Q. Lv , J. Wang , F. Bao, Q. Gong , J. Xia and Y. He. 2014. Nitric Oxide Induces Cotyledon Senescence Involving Co-Operation of The NES1/MAD1 and EIN2-associated ORE1 Signalling Pathways in Arabidopsis. Journal of Experimental Botany, 65 (14): 4051–4063. Guardiola, J.L and J. F. Sutcliffe. 1971. Control of Protein Hydrolysis in The Cotyledons of Germinating Pea (Pisum sativum L.) Seeds. Arm. Bot, 35: 791-807. Gusta, L.V., E.N. Johnson, N.T. Nesbit and K.J. Kirkland. 2003. Effect of Seeding Date on Canola Seed Vigor. Can. J. Plant Sci., 45: 32-39. Hartawan, R. dan Y. Nengsih. 2012. Kadar Air dan Karbohidrat Berperan Penting dalam Mempertahankan Kualitas Benih Karet. Agrovigor, 5 (2): 103-112. Haryanti, S dan R. Budihastuti. 2015. Morfoanatomi, Berat Basah Kotiledon dan Ketebalan Daun Kecambah Kacang Hijau (Phaseolus vulgaris L.) pada Naungan yang Berbeda. Buletin Anatomi dan Fisiolog, 22 (1): 47-56. Iswanto, A. and H. Winarno. 1997. Potential Fine-flavored Cocoa Clones to Produce Purple and Necrotic Beans. Pelita Perkebunan 13: 1-7. Kesari, V. and L. Rangan. 2011. Coordinated Changes in Storage Proteins During Development and Germination of Elite Seeds of Pongamia pinnata, A Versatile Biodiesel Legume. AoB Plants, 1-16 . http://dx.doi.org/ 10.1093/aobpla/plr026. Kim, H. T., U.K. Choi, H.S. Ryu, S. J. Lee and O.S. Kwon . 2011. Mobilization of Storage Proteins in Soybean Seed (Glycine max L.) During Germination and Seedling Growth. Biochimica et Biophysica Acta, 1814: 1178–1187. Lehrian, D.W. and Patterson, G.R. 1983. Cocoa fermentation. In: Reed, G. (ed). Florida: Biotechnology Vol 5. Verlag Chemie. Weinhim. Lopez, O.P. dan Escobedo, M. 1989. Germination of Amaranth Seeds: Effect on Nutrient Composition and Color. Journal of Food Science, 54: 761-762. Martini, M.H. C. G.veslenci, A. Figueira and D. D. Q. Tavares. 2008. Localization of The Cotyledon Reserves of Theobroma grandiflorum Willd. ex Spreng.) K. Schum., T. subincanum Mart., T. bicolor Bonpl. and their analogies with T. cacao L. Revista Brasil. Bot, 31 (1): 147-154. Marwati, H. Suprapto, dan Yulianti. 2012. Effect of Maturity Levels on Cocoa (Theobroma cacao L.) Beans Quality Produced By Cocoa Farmers at Teluk Kedondong, Bayur, Samarinda. Jurnal Teknologi Pertanian, 8 (1): 6-10. Menteri Kehutanan dan Perkebunan. 1998a. Deskripsi kakao varietas AP 70 Berdasarkan Keputusan Menteri Kehutanan dan Perkebunan. Nomor : 686/Kpts-IX/98. tanggaL : 9 Oktober 1998. Jakarta. Menteri Kehutanan dan Perkebunan. 1998b. Deskripsi kakao varietas AP 71 Berdasarkan Keputusan Menteri Kehutanan dan Perkebunan. Nomor : 686.a/Kpts-IX/98. tanggaL : 9 Oktober 1998. Jakarta. Menteri Pertanian. 2009. Deskripsi kakao klon Sca 6 Berdasarkan Keputusan Menteri Pertanian. Nomor : 1984/Kpts/SR.120/4/2009. Jakarta. Motilal, L.A., G.S. Charran and T.N. Sreenivasan. 2003. 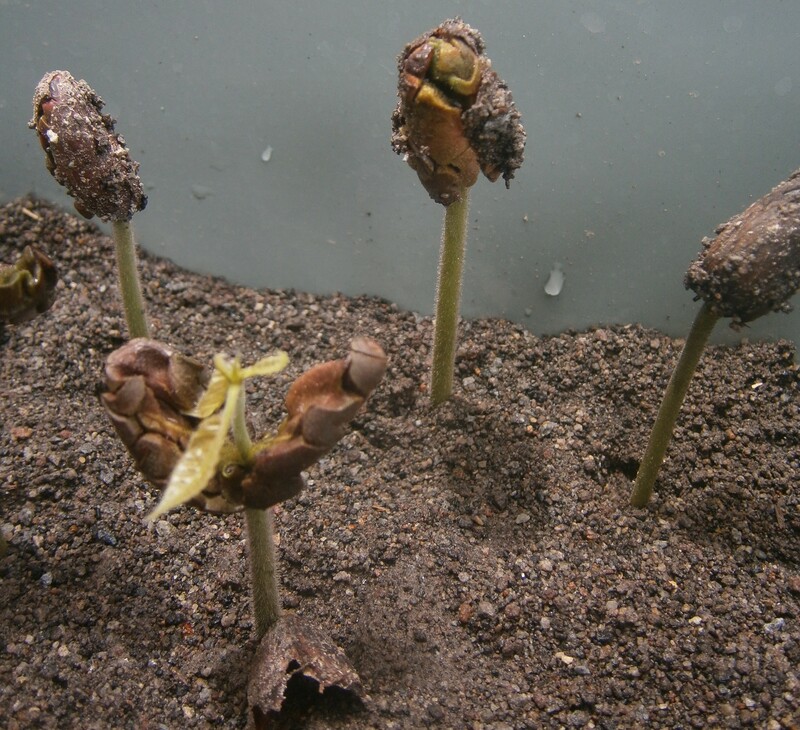 Effect of Crinipellis perniciosa Infection on Abscission of Cacao Cotyledons, Reserve Mobilization and Dry Matter Partitioning. J.Phytopathology, 151:546–552. Mundo, S.M.L., M.X.Quintanilla-Carvajal, C.B.Muńoz, G.F. Gutiérrez-López and M.E.Jaramillo-Flores. 2015. Water Content, aw, and Enzyme Activity (Xaa-Prolyl-Dipeptidyl Aminopeptidase) During The Germination Processof Cocoa Beans (Theobroma cacao L.), p. 533-540. In: NewYork: Water Stress in Biological, Chemical, Pharmaceutical and Food Systems. Muslihatin, W., N. Jadid, I. D. Puspitasari, and C. E. Safitri. 2016. Growth of Vegetative Explant Moringa oleifera on Different Composition of Auxin and Cytokinin and its Synthetic Seed Germination. in: AIP Proceeding ofInternational Biologi Conference. Pancaningtyas, S., T.I. Santoso and Sudarsianto. 2014. Studi Perkecambahan Benih Kakao Melalui Metode Perendaman. Pelita Perkebunan 30 (3): 190-197. Permana, D.G.M., R. Indrati, P. Hastuti, dan Sparmo. 2013. Indogenous Lipase Activities During Cocoa Bean (Theobroma cacao L.). Agritech, 33 (2): 176-181. Pertiwi, S. F., S. Aminah and Nurhidajah. 2013. Antioxidant Activity, Chemistry Characteristic, and Organoleptic Properties of Sprouts Milk of Black Soybean (Glycine Soja) According to Variation of Time Germination. Jurnal Pangan dan Gizi, 04 (08): 1-8. Pranoto, H.S, W.Q Mugnisjah and E. Muniarti. 1990. Biologi Benih. Bogor: Institut Pertanian Bogor. 138 p.
Rayan and D.D.N. Cahyono. 2011. Effect of Seed Size From West Kalimantan on Seed Growth of Shorea leprosula in Nursery. Jurnal Penelitian Dipterokarpa, 5 (2): 11-20. Rubiyo and Siswanto. 2012. Peningkatan Produksi dan Pengembangan Kakao (Theobroma cacao L.) di Indonesia. Buletin Riset Tanaman Rempah dan Aneka Tanaman Industri, 3 (1): 33-48. Saleh, M.S. 1994. Deteriorasi Biokimiawi dan Benih Kakao Berkecambah Selama Penyimpanan. Agroland, 2 (6):1-5. Sudarmadji, S., B. Haryono dan Suhardi 1997. Prosedur Analisa untuk Bahan Makanan dan Pertanian. Yogyakarta: Liberty. Turnbull, C.J. and P. Hadley. 2015. International Cocoa Germplasm Database (ICGD). [Online Database]. CRA td./ICE Futures Europe/University of Reading, UK. Available: http://www.icgd.reading.ac.uk [Accessed 3 October, 2017]. Voigt, J., S. Kamaruddin, H. Heinrichs, D. Wrann, V. Senyuk and B. Biehl. 1995. Developmental Stage-Dependent Variation of The Levels of Globular Storage Protein and Aspartic Endoprotease During Ripening and Germination of Theobroma cacao L. Seeds. J. Plant Physiol, 145 : 299-307. Widjayanti, E., E. Murniati, E.R., Palupi. T.Kartika, M.R. Suhartono and A. Qadir. 2013. Dasar Ilmu dan Teknologi Benih. Bogor: IPB pers. 173 p.
Winarno, F.G. dan S.L. Jenie. 1974. Dasar Pengawetan, Sanitasi dan Peracunan. Departemen Teknologi Hasil Pertanian, Fatemeta, IPB. Bogor. Yudono, P. 2015. Perbenihan Tanaman Dasar Ilmu, Teknologi dan Pengelolaan. Yogyakarta: Gadjah mada university Press. 308 p.